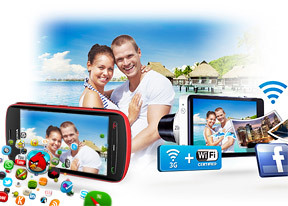 The Samsung Galaxy Camera and the Nokia 808 PureView are quite different in terms of imaging hardware and software. As a result, they're quite different in terms of image quality too. We've prepared crops to a couple of collages to help judge the quality. We start of with photos shot in good lighting conditions with no zoom, the devices were held in the hand. 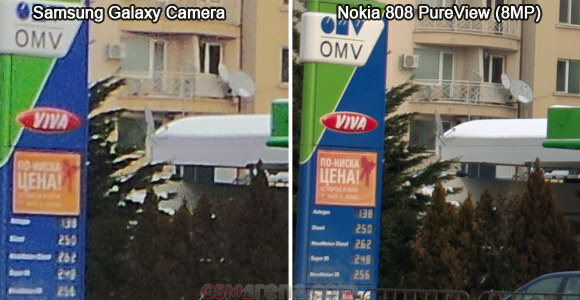 For the Nokia 808 we used both 8MP PureView mode and Full resolution mode to see how it stacks up with the 16.3MP Galaxy Camera photos. The first 100% crop is very telling of the image quality difference. Despite having double the pixels, the 16MP shots from the Galaxy Camera just don't look nearly as detailed as the 8MP PureView photos. The 1/2.3" sensor shows quite a bit of noise, which drowns out a lot of the fine detail. The Nokia 808 takes advantage of its super sampling abilities to eliminate the noise and images look much sharper. The bigger 1/1.2" sensor also has an advantage in dynamic range - there's a lot more detail in the dark bushes compared to what the Galaxy Camera managed. Colors are fairly accurate though they can be a little muted. The Samsung camera is close too, though it chooses more saturated colors (especially in the green channel). The second 100% crop throws the 38MP full resolution mode of the Nokia 808 into the mix. The noise in the Samsung Galaxy Camera photos once again smears out fine detail, but there's chromatic aberration coming from the lens too. 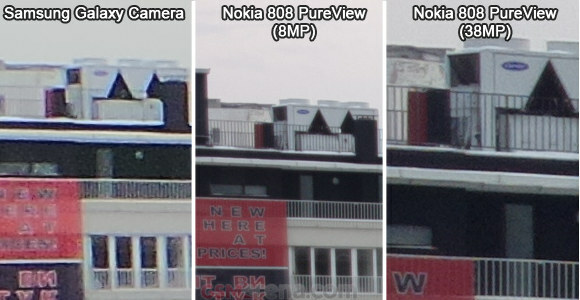 The Nokia 808 PureView offered more detail in both 8MP mode (which uses super sampling) and 38MP mode (which just renders pixels as they are). Here are some full-resolution shots if you want a closer look at the whole image. Zoom is a big feature for the Samsung Galaxy Camera, so let's see how it does. As it turns out, the droid camera really starts to come into its own when you zoom in. We tried it at 2.2x zoom, which just about matches the maximum zoom of the Nokia 808 PureView. The quality of the Galaxy Camera actually improves when you zoom it. The Nokia 808 photos still have less zoom (even though it can no longer take advantage of super sampling), but the results are very close indeed. Of course, this is just the beginning of how much the Galaxy Camera can zoom, the Nokia 808 can go no further - there's not even digital zoom (which we wouldn't recommend using anyway). 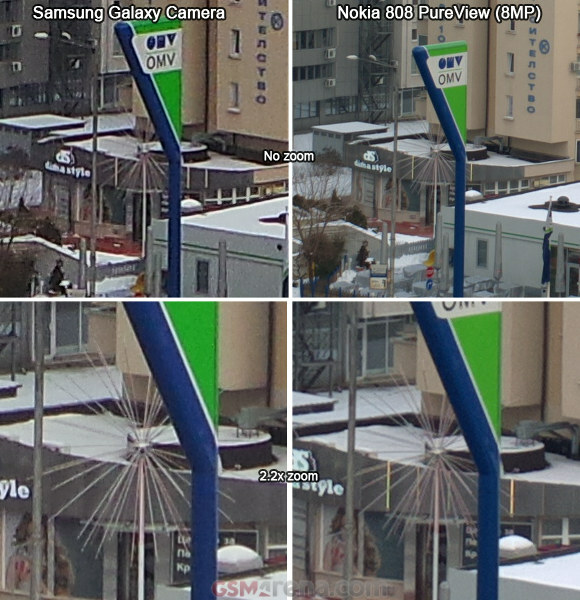 And here are the full resolution shots we used for the zoom comparison. We also took a couple of macro shots. The Galaxy Camera was able to get really close to the subject, while the 808 PureView had to shoot from a distance. The full resolution shots below were taken from the same distance to level the playing field. While the Samsung Galaxy Camera doesn't have a very big sensor, you can still get a relatively nice depth of field effect with the macro mode. The effect isn't as pronounced in Nokia 808 PureView photos. We have to split our conclusion for this chapter into two - with and without zoom. Without zoom, the Nokia 808 PureView is clearly the better shooter - even in 8MP PureView it offers much better image quality and the ability to shoot 34MP/38MP (depending on the chosen aspect ratio) while maintaining a lot of that quality is great. With zoom, however, things start to level off. At two and a bit times zoom, the maximum the 808 can achieve, the Samsung Galaxy camera has almost caught up. And it can go well beyond 2x zoom as we saw in the previous chapter.